The rooftop bar at Little Albion is a popular hangout for guests. Little Albion, located in Sydney’s Surry Hills, has become the newest member of the Crystalbrook Collection after the growing hotel group officially took ownership of its first Sydney property. The ownership change was confirmed in a ceremony held today and attended by Crystalbrook Collection CEO Mark Davie, Group Director Geoff York and Little Albion General Manager Wendy Morris. It marks the second major event in the last month for the rapidly expanding group, following the opening last month of ‘Riley’, the first of three new resorts in Cairns. At this stage, it appears the only change made as part of the ownership transfer has been the removal of the words “Guest House” from the property’s official title. 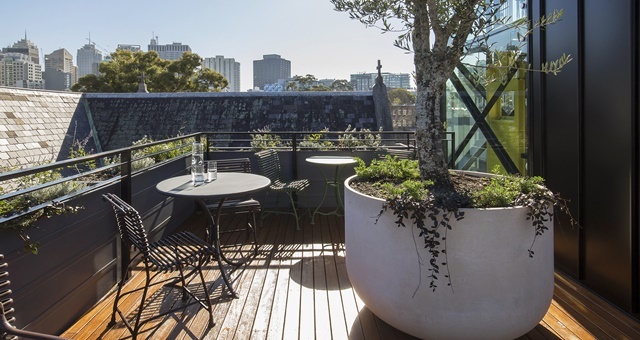 The 35-room Little Albion hotel is housed within a historic building and offers guests immediate access to the CBD and a boutique accommodation experience complete with a rooftop garden. Hosts at the hotel are all Surry Hills locals who can provide first-hand knowledge of the area’s highlights for guests to enjoy. GM Wendy Morris said all existing staff have been retained following the ownership transfer. Crystalbrook CEO Mark Davie echoed Morris’ comments, saying the group had been looking for its entry point into the Sydney market for some time, but that it had to fit the group dynamics.